In reconstructing the guardhouse domes we rely on a combination of physical and documentary evidence. 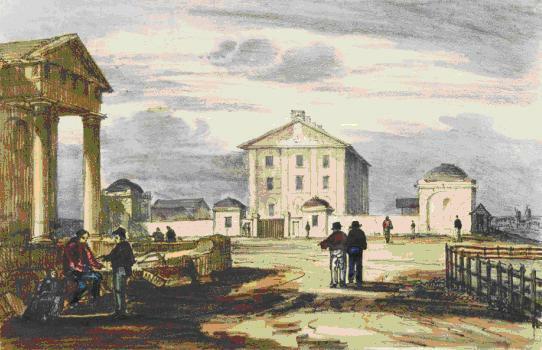 There are a number of early views of the Hyde Park Barracks, from sketches to watercolors and, in this case, lithographic prints. Their accuracy varies considerably and while some, such as this scene by Robert Russell (b.1808 d.1900), show a close attention to proportion and detail others verge on the eccentric. This particular scene is one of a series published in Sydney in November 1836 that includes many of the Macquarie period buildings in and around Sydney. They are of particular value as many – such as the fanciful Gothic revival tollhouse at the start of the Parramatta road – were later destroyed. This view of the Barracks is particularly evocative of the relationship of St James to the Barracks and the plaza in between. All of Russell’s views have a distinct ‘Conrad Martens’ feel to them, especially in his treatment of plants and clouds. This isn’t surprising, as Russell was one of Martens’ first pupils in Sydney and paid for lessons in September 1835, shortly before he drew these views. A feature of these prints is they way they capture the feel of his original pencil sketches. That Russell was a surveyor by trade also isn’t unusual; surveyors needed to be skilled at representing topography as this was a valuable aid to navigation and exploration. Expeditions to new territory also included artists for just this reason: when on board the Beagle one of Conrad Marten’s roles as project artist was to accurately portray the elevations of the coastlines the ship passed. Hyde Park Barracks Domes Restoration Project is powered by	WordPress 4.7.13 and delivered to you in 0.469 seconds using 34 queries.